My name is Heather and I live in Livingston, Scotland with my husband William and 4 amazing children, Hannah, Joel, Billy & Beth. I've been an Alarm fan since 1984, when my brother came home with the Declaration album and played it continuously. My first concert was in Kilmarnock Town Hall in 1987 and I've rarely missed a Scottish date since. When I turned 40, I was pregnant with our youngest child and due to problems with my pelvis, was practically housebound. I decided to write a bucket list and first on the list was Nevis Rocks. The event became even more meaningful for us due to a recent cancer scare. 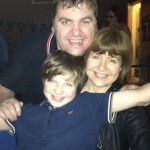 William had been going through a period of ill health, chest infections and pneumonia. The doctor thought he had TB but when the TB markers started coming back negative, everything was pointing at lung cancer. I've never been so scared in all my life. After various tests and waiting for results and more tests and more waiting for results, it was discovered that William had no right pulmonary artery and his right lung was severely damaged. This is an extremely rare condition so we don't know exactly how this will pan out in the future. Thankfully, William has always kept himself fit and healthy and his left lung is compensating so we decided to go ahead with Nevis Rocks. It was a great weekend after a really difficult few months. We met so many lovely people and hope to see you all again. We are planning to do Snowdon Rocks next year with the eldest 2 children. Another from my bucket list. 1 down, 49 to go! was when we first heard about his fight against cancer. 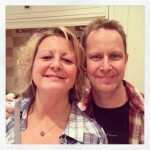 he told me his Mum lived next door to Tony Iommi's Mum! (Another rock great who has found himself fighting cancer). the bed for two days but I like to think it's because she understands me . show back in1983, I remember the words "These are a band to look out for"
the band raised the guitars for Declaration. moment's notice. That was their journey. back every year to support LHS to help make a difference . Ghandi the man who can move mountains . People ask me why do I do it ? year , it's the LHS family as well..
My name is Carolien Mekenkamp, also born and raised in Holland just like my boyfriend Peter Korfker. I am 44 years old and a mother of 2 adult boys. Since 3 years I work in a pharmacy as an assistant. Before this I worked in a nursing home. Before I (re-)met Peter I had never heard from Mike Peters or the Alarm but I joined Peter to the gathering in 2009 and it was a great experience! Throughout the years I learned more about the life of Mike. And I admire the way Mike (and Jules) deal with the knowledge of having cancer. As everybody else I know people who had/have cancer, like Peters daughter and my ex-daughter-in-law. Both children when it was discovered. Luckily both healed. For myself it was last year a scary moment when I found a lump in my breast, luckily it was a cyst filled with fluid. But at the moment you don't know what it is, you're in a rollercoaster of emotions. All of this combined with the good cause (fundraising for research) and our vacation makes this a great opportunity to walk Snowdon. 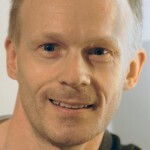 My name is Peter Korfker, 44, born in and still living in the Netherlands with my dear Carolien. I'm a proud father of 4 children: Rachel 18yrs, Nathan 16 yrs, Joash 14 yrs and Chananja 9 yrs. All of them live with their mom. 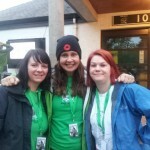 There are 3 reasons I will walk Snowdon. In chronological order. First, as a kid, at the same age of my eldest kids now, I got to learn the Music of Mike, The Alarm. I remember it didn't even work on me at first but I knew it was different. And that is what I wanted to be at that age. Before I knew it, The Alarm stopped. Years went passing by. Then I found out that Mike went on on its own. The internet made it easier to follow. All the new music came my way easily. I was at a few gigs in Zoetermeer, Hilversum,Helmond, Neerpelt and Krefeld. In 2009 my first and only Gathering untill now, followed. This is what the music and words do to me. Whenever down and out, it builts me up. Faith helps me too very much, but Mike surely gives me words and music to it. Secondly, Rachel, my daughter was diagnosed with skincancer in 2008. Our worlds fell apart. No futere? So young, 12 yrs, why?? So many questions, so few answers. After 2 operations the doctors said she was clean. And she stayed clean till this very day! Praise God. In januari 2009, the Gathering, I came there with all these mixed emotions. Besides the great fun I had, enjoying the music, the music and Mike's story sure were soothing to me. 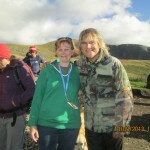 My journey with Love, Hope, Strength (LHS) began in 2011 when I unexpectedly encountered one of my teenage rock n roll favorites, Mike Peters of the Alarm, as I climbed Mount Snowdon for the testicular cancer charities Mark Gorry Foundation and Check ‘em Lads. I had never heard of LHS and their mission of getting people on the bone marrow registry list. I was impressed that Mike who knew who our charity was, and that he even gave us a shout out as we climbed by the LHS trekkers who had gathered to hear Mike sing at the midway point of the climb. The next year, I moved from Indiana in the States to Denver, Colorado where I work at the Veterans’ Hospital as a nurse. Low and behold, I discovered LHS’ American chapter was headquartered in Denver just about two miles from my home. I had come across one of their swabbing events at the local sports arena and immediately thought to myself how cool it would be to support such a great mission of providing hope and strength through love of fellow humans by volunteering my time to help find matches for those facing blood cancers. Last summer, I helped out at my first LHS event at a local Celtic festival. I love meeting the other fabulous volunteers and also doing a small part to provide other cancer survivors with the hope I knew from personal experience of having testicular cancer that is so vital when taking on a diagnosis of any kind of cancer or serious condition. This summer, I planned a trip with my father to Normandy, France, to remember and honor the 70th anniversary of my grandfather and uncle and all the brave men and women who landed on Omaha Beach and elsewhere in Normandy. Unbeknown to me, both Ben Nevis Rocks and Snowdon Rocks were taking place in June. I quickly decided that I must experience both of these mountain climbs with LHS, my favorite cancer charity whose mission I feel is so valuable to those facing cancer—Providing HOPE. And so, this month finds me having had the honor of climbing Ben Nevis last Saturday with all the LHS trekkers, meeting Mike Peters again, and, for the first time, his lovely wife, Jules, and many other wonderful, kindhearted people. And this Saturday, we conquer Mount Snowdon too! I feel so blessed to have experienced the Normandy remembrance as well as these two wonderful charity events. While I do not have a close personal connection to any one who has had blood cancer, I am personally at higher risk for developing blood cancers later in my life due to the radiation exposure I received during my testicular cancer surveillance. Hence, LHS’ mission to me IS a personal mission. And, thus, I share in the passion I so quickly could see in the work of so many LHS volunteers and “Rock Stars”—a passion that brings HOPE and STRENGTH to so many people facing cancer, and done so in such a LOVING way by helping to find donors that so selfless give a literal part of themselves to save lives. See you all you Trekkers at Snowdon! Rock on, Swab on! Christopher Schepper—LHS swabber and 17-year cancer survivor. My Ben Nevis story began over three years ago when I heard Mike Peters announce the first Ben Nevis Rocks at a Big Country gig. My first Ben Nevis Rocks helped me combine three things that were prominent in my life at that time, live music, the opportunity to climb Ben Nevis, which was something I had spoken about for many years...and most importantly at the time, the awareness that a good friend of mine was desperately seeking a bone marrow donor. The difficulties both he hand his family faced at that time ( he did finally find a match) fueled my fire to do something meaningful. Little did I know the journey that I was about to begin...after the Friday night gig, the candle-lit vigil gave me, for the first time, due to many reasons the opportunity to grieve my Granny (Grandmother) who was lost to cancer when I was just 7 years old. On the assent of the Ben the following day I carried thoughts of her all the way and got to say my "farewell" to her when Mike asked for any names of people we wanted to remember. During this time I also met some wonderful people, who over these past few years have become good friends as my involvement in the work of LHS has continued, as, having heard of the great work that was being done by LHS I wanted to become involved. So, this year's Ben Nevis Rocks, which I wasn't sure if I was going to be able to attend due to illness, has been a time for catching up with old friends, so many wonderful conversations...not only over the weekend, but also in the lead-up weeks as the excitement built up.... making new friends, a time for reflecting on the wonderful work of LHS, the amazing energy and enthusiasm of Mike & Jules Peters, the courage of Dave Spragg, the madness of Lydia Franklin and Mickey Collins........and the dedication of Steve Webster, Marion & Lindsay and all the other volunteers who were swabbing over the Nevis Rocks weekend and most other weekends. Also not forgetting...the opportunity to sing "Merry Christmas Everybody" in June!! 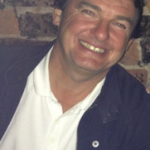 My name is Mark Mitchell, married to Bridget and father to 3 great kids, James, Emily & Katie. With 30+ years of corporate life behind me including countless excuses for not participating in such great causes as the Love Hope Strength Foundation, I’m finally done with excuses and really looking forward to the challenge of Mount Snowdon walking with good friends and getting to meet the infamous Mike Peters. 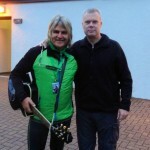 I have been following the music of Mike Peters and the Alarm for over 25 years and have enjoyed many gigs all over the Country which have given me a lot of happy memories. I was inspired by Mike and Jules to join Snowdon Rocks 7 last year to try and raise money for a fantastic charity which has helped so many people. It was one of the worst and best things I have every done, walking with some amazing, inspiring people and enjoying the beautiful scenery and Mike's music. Immediately after Snowdon Rocks 7 we knew we wanted to join Snowdon Rocks 8 and we are really looking forward to Saturday. We first found out about the Love Hope Strength Foundation last year at the Isle of Wight festival as we were intrigued by the opportunity to combine two of our greatest loves - music and walking up mountains - whilst also supporting a charity that is close to our hearts. We decided to take part in last year's Snowdon Rocks which was an amazing experience - standing listening to the musicians halfway up the mountain and then again at the summit was something we'll never forget. Not to mention the impromptu concert at the cafe afterwards! We were gutted we couldn't make Ben Nevis Rocks,but we are really looking forward to Saturday - the weather forecast is looking good and we know our way from the campsite this year (we were nearly late arriving last year but that's another story!). We've been searching for something green to wear and are looking forward to being part of this very special event. Hi, my name is Iain Mclean, I’ve been a huge ‘Alarm’ fan for 30 plus years, I first saw Mike perform on the 23rd Dec 1985 at the Barrowlands in Glasgow, awesome concert venue, it was my first ever concert in fact and it was an amazing night. I have of course seen Mike perform countless times since … Why I wanted to get involved in LHS, In Dec 2007 five months after losing our Mum, my brother Stewart and his wife were celebrating the birth of their twin baby girls, only seven months later we had the devastating news that a condition Stewart had been suffering with but which had been wrongly diagnosed was in fact cancer, as it started in his cheekbone it required some hugely invasive and distressing surgery and many sessions of radiation treatment that involved long trips to the hospital daily. Any early hopes of recovery were soon shattered and after several further failed operations and treatment my brother Stewart died at the Loros hospice in Leicester Aug 2010. His little girls hadn’t reached their third birthday. Our hearts were broken .. Although I have supported two or three different cancer charities for the last few years I was keen to get involved and do more, so checking the ‘The Alarm’ website I noticed the Link to the ‘Love, Hope & Strength’ site and read up on the first Ben Nevis climb, perfect I thought. I was actually going to do Ben Nevis 2 but I injured my leg three weeks before the event, so I waited for the announcement of Ben Nevis 3, you can imagine how delighted I was when I saw it was to be much earlier this year, the 14th June, my Birthday. I couldn’t miss this one, so with great encouragement from my girlfriend I booked my place on the climb and did some training to prepare. It was a huge thrill to meet and speak with Mike on the day and I enjoyed meeting the rest of the gang as we all completed the Ben Nevis trek, we also had a great time at the post climb gathering and Mike singing ‘Happy Birthday’ to me will live long in the memory, thanks to everyone who joined in. I was pleasantly surprised how well I did on the trek up Ben Nevis, I thought I may well have struggled badly. I had an amazing day and more importantly I raised £660.00 for a fantastic cause. It was my 46th Birthday, the same age my brother was when he passed away, where does the time go. I hope he would be a little proud of me, because I was massively proud of him..
My name is Tony, a photographer with a love for the outdoors - the more remote and wild the better. I also love my music, so Snowdon Rocks combines the best of both worlds! A very good friend of mine Andrew Dawes is a long time fan and supporter of all things Mike Peters, so I'll be walking with him and thoroughly looking forward to a great day out. Good company and a great cause - what more do you need? Let me introduce myself ...... (as I fear on Saturday at times I couldn't even find the energy to nod my head never mind to say hello) ..... I'm Kristine and I HATE hillwalking!!!!!! There I've said it!!!!! Although to those that know me this comes as no real surprise! I have been an Alarm Fan since 1984 and my first gig was in 1987 in Kilmarnock. The music of The Alarm/Mike Peters has always played a big part in my life ..... wedding/birth of my daughter and even funeral! This was my second time up The Ben!!!!! Why do I do it ...... simple ...... doing my bit to fight cancer and what better way than to support LHS. My life is probably the same as most ...... ups and downs!!!! Cancer first hit our lives in 2003 when my nephew at the age of 9 was diagnosed with Leukaemia which he fought and lived to tell the tale. Then in 2007 I got a DVT and quite literally was close to death but I lived to tell the tale. In 2009 my big brother died suddenly and the post mortem showed the cause of death was a pulmonary embolism. A few weeks later my Dad had a heart attack but thankfully lived to tell the tale. Then my Mum was diagnosed with lung cancer and had one lung removed. Everyday for my Mum was a struggle after that. In October 2010 my Mum sadly passed away, (there's not a day that I don't miss her) not of cancer but of a pulmonary embolism. I got tested at the local hospital and the consultants are now convinced that my family are carrying a gene that is prone to clotting but that the gene has not yet been identified. 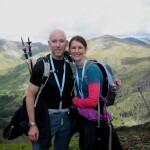 In February 2013, along with my lifelong friend Ashley Gray decided to support LHS and registered for Ben Nevis Rocks 2. We trained hard for this and was well prepared .... or so we thought! What can I say about that day .... it was bloody awful ..... it poured from the high heavens and it was feckin freezing cold .... 20 mins into the climb I fell and hurt my ankle (later to find out I had torn my tendons) it was just bloody awful and every single step was a struggle On my return I was moaning to my husband about just how hard it was and he brought me back to reality with a thud ...... he told me to remember that every day for my Mum after she got her lung removed was a struggle ..... even just going from one room to the other was a struggle and in her words "Going upstairs is like climbing a bloody mountain" ...... so with this in mind ...... we signed up for Nevis Rocks 3 and got a new mug, oops sorry I mean new recruit to join us (our school friend Mary McCusker). We also volunteered and did some swabbing at a recent gig and looking forward to doing more in the future! Training this time round for the climb was pretty much non-existent due to the fact that I dropped a fridge on my foot breaking my toe (don't ask long story!) The weather this time was much better ..... we could actually see where we were going .... which in hindsight I'm not so sure was a good thing! But yet again every step was a struggle! Nae idea how people do this for fun! However I remembered my Mum's mantra in life ...... you can't control the sh*t thrown at you in this life ...... but what you can control is how you react ..... so you have two choices in life ...... you can choose to be happy or you can choose to be sad ....... all the worrying in the world won't change a damn thing! So with that in mind ..... I choose happy ....... Thanks Mum! Thanks also to old and new friends for a great nite on Saturday ..... the best part of the weekend by far ...... Mike and Jules you always throw one hell of a party and for that I thank you both! So dare I say it ..... third time lucky?!?!?! 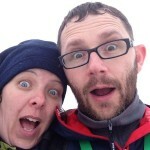 Hello we are Paul & Rachel Eyre and next year we celebrate 20 years of marriage. Paul works as an engineer and I work for a trade association for public health pest control. We have personal experiences of loved ones both having had cancer and survived together with those who are no longer with us. We have followed the career of Mike from the earlier days with the Alarm up to present day whether it be seeing Dead Men Walking, Big Country or watching his cameo in Vinyl. Our first trip to Snowdon as part of the Love, Hope, Strength Foundation was last year and we have pledged to continue to join you each year to support the cause for as long as our own health allows. The reason for this is to support where we can to help beat this terrible disease. It is also a time to reflect (in a good way) on those who are no longer with us and unable to join in the fight alongside others who are in similar situations. hi this is my second walk up Snowdon,i walk for my dad and brother who both died of cancer .and to all the people that have cancer. 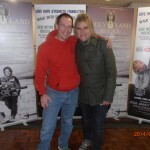 met so many nice people last year had to do this again and for mike peters a hero of mine LHS . 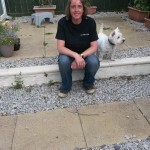 Helo pawb, I will be joining the Snowdon Rocks 8 after wanting to do this for years. 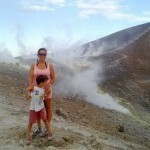 I am walking with my son, Giorgio aged 10 who is looking forward to the day. I have been a fan of Mike and the Alarm since seeing TOTP as a teen. I went to live in Italy in the late 80s for a few years and listening to the Alarm kept me connected to my Welsh identity. I remember making my friend go on a hunt for a copy of TÂN before she could board the plane to visit me. Have been to a few concerts too, both in Italy and Wales. LHSF is special to us as we are local to the area and have lost family members to cancer as well as cared for those who have been successful in their treatment. 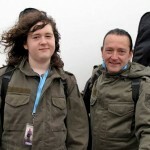 This will be Giorgio's first gig so a truly memorable day for him, he's already walked up Snowdon this year.! Hi, my name is Jillian Mclaren, I am 46 yrs old and mother to Jamie (23), Harry (15) who played guitar at the top of Ben Nevis with Mike, Charlie (13) and Ben (12). I first got into The Alarm when my partner Tony Roxburgh asked me to climb Ben Nevis in 2012 with Mike Peters and me being into bagging Munros agreed. Since that day (25th August 2012) we have been to The Gathering twice (have tickets for next year), have seen The Alarm in Glasgow and have seen Mike in Glasgow, Edinburgh (twice) and Newcastle (twice) and just can't get enough of them! I was diagnosed in 2006 with an autoimmune disease called Primary Biliary Cirrhosis (nothing to do with alcohol) - I was fine until 2012, then the itchy skin started (caused by PBC), tablets worked for a year but by June 2013 I was so bad that I was unable to cope with anything, my life just stopped, I couldn't sleep for the itch, couldn't get any relief from the itch so was signed off my work and spoke to no one and didn't often leave the house. In September 2013 I started an intense course of Plasma Exchange Treatment which lasted four weeks, I then went on to weekly treatment and I'm currently now on fortnightly treatment. I really got into LHS Foundation when I realised that the machines used for Stem Cell Donation/Collection for cancer patients are the same ones I use at Edinburgh Royal Infirmary. I contacted Lydia Franklin and offered to be a volunteer (nothing suitable has come up yet). My name is Mel Humphreys. I was diagnosed with breast cancer May 2012, had a mastectomy, lymph nodes removed, completed chemotherapy and radiotherapy by December. When we moved to Wales 12 years ago I said I would climb Snowdon- but you know what it’s like, I kept putting things off. Thanks to Mike and Jules I was given the incentive for an adventure September 2013. What an adventure! stunning views, great weather (most of the time), brilliant encouraging fellow Snowdoneers, and raising money for cancer facilities. There were times when I thought I would never get to the top, especially when I saw the train a mile above me- then I looked down at my feet and said “one step at a time”. A bit like dealing with cancer treatment- concentrate on that step and don’t stress about the mile ahead. 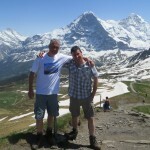 Thank you Jules, Mike and family for organising the next Snowdon adventure. Photo is from Snowdon 2013 “On the way down!” I’m on the left, my friend Julie is on the right. I am a big fan of Mike Peters the musician and also as a fund raiser for cancer charities. I am a keen runner having run 84 marathons up to now. I will be doing 10 more this year to reach a total of 94 by 2015. I will reach marathon 100 by November 2015 and I have chosen to run it for Love, Hope and Strength. I think everyone knows of someone close to them that they have lost to cancer. I am hoping to do the Everest Marathon 2015 for Love, Hope and strength my 100th, so I think by climbing Snowdon it will be good practice for what lies in wait for me next November, if I am lucky enough to get in the race. Looking forward to Snowdon Rocks. Love, Hope and Strength. Hi, my name is Jane. I live in Leeds and I'm a single mum to 2 teenagers. Snowden rocks incorporates for me the two big loves of my life. In my spare time I am often to be found somewhere in the Yorkshire dales with my hiking boots on. I am also a member of a massed voice choir called Inspiration, we were lucky enough just recently to open at Carnegie Hall in New York, an experience I'll never forget. Having watched a work colleague lose his 34 year old wife to cancer last year, doing this walk became a no brainer for me. I truly love the way in which this foundation manages to incorporate music into it's fundraising and can honestly say that Mike's music in the past has helped me to deal with my emotions through some personally very challenging times. I will be travelling alone to this event so if any of you see me around it would be great if you would come up and say hello. It would be lovely to leave having made lots of new friends. My name is Dave Rowley. Music has played and does play a massive part in my life, as a musician and a fan; and The Alarm are an integral part to the soundtrack of my life. In 2003 my father lost his battle with pancreatic cancer…that short journey from his diagnosis to his passing away was a special time…so sad, yes, but a time when those things that often go unspoken can be said…like I love you! The LHS walk has an added significance as North Wales and Snowdon were the place of our childhood holidays. I am married to Melanie and have 3 boys, Jude, Jonah and Eli, and now fully understand a father’s love for his children. I am so proud to be walking up Snowdon, guitars in hand with my son Jude … it makes what is a special time and place even more special. My name is Derren Jones,I work as a foster carer for Conwy Borough Council and live in Llandulas. I love Snowdonia and hillwalking in general,I recently returned from a hiking trip in Switzerland. I have formed my own facebook hiking group,the Snowdonia Beerbellies. I also work for Asda and last year raised £800 with my colleagues for the charity Tickled Pink. I have known Julie for years as she is a friend of my sisters , my parents just live down the road from their house in Dyserth. I have been an Alarm and Mike Peters follower for donkey's years . I am so proud to be associated with this extraordinary family who have and continue to inspire me. I have recently retired from my work as a head teacher which I thoroughly enjoyed. My prime concern was always the children and their families and seeing how cancer can hit some children and adults indiscriminately makes me want the best posdible care for them..I am married to Jude and it has been an amazing 37 years but it has been tinged with much upset. Our daughter Delyth died of ovarian cancer aged 8 and a half,a very nasty and aggressive strain which would have been tackled more successfully today. 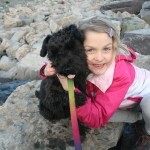 We had to travel to Liverpool and the Wirral for Delyths care. However she passed away in Glan Clwyd with an incredible group of doctors and nurses behind us in all that we went through. My mother in law also died of cancer as did my own mother. Having The Love Hope Strength Foundation to help raise money for local hospitals and related projects has been incredible. People can get support , relief and comfort from the resources that have been bought with the money we have helped raise.My brother has been fighting his cancer for two years and is doing well. I did the first two Snowdon Rocks walks and have supported LHS in other ways too by holding local fundraising events. I am suffering myself with my feet but I am so driven to do Snowdon Rocks 2014 because I really do not have anything to moan about .My respect love and hopes go out to all those who will be out there supporting Snowdon Rocks especially the wonderful Peters Clan . BRING IT ON!!!!!!!! Hi my name is Derry Barton. I am 45 and from liverpool. I am married and have 2 lads called Rhys 6 and Ellis 4. I have been self employed industrial roofer for about 27 years. I heard about the organisation and the walk through a good friend Ken Kelly. 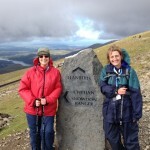 I like what the charity does and liked the idea of walking up snowdon. I met Ken about 1988 when we were in a band and got the chance to have a couple of songs put on his second compilation album that he was producing. Looking forward to the walk and hope we can raise as much money as possible. Thanks. Lee and I have always been fans of Mike Peters and since 1984 have watched him perform many times (including Wembley Stadium and Cardiff Arms Park) – we were shocked to hear of his illness but even more so when it returned. We have always been keen to walk Snowdon with Mike and have the pleasure of hearing him perform in the open air once again. This year our own lives have been touched by cancer – our 16 year old nephew Ryan was diagnosed earlier this year with a tumour on his leg and he has bravely gone through chemotherapy and surgery. He is certainly fighting the fight. Therefore, we felt it was a great time to celebrate recovery, look to the future and enjoy Mike’s voice as we marvel at the Welsh mountains. Our son George (aged 11) is joining us so we have been playing lots of Alarm music in the car – he loves music so is really looking forward to it. 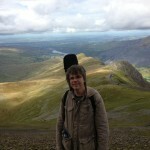 Hi, I'm Andrew Dawes and Snowdon Rocks 8 will be the 5th time that I've taken part in Snowdon Rocks. The charity is particularly important to me as I know first hand the wonderful work it does because of the illness of a close family member, my Uncle Terry, in North Wales. My Uncle has been wonderfully looked after at Ysbyty Gwynedd and I know that a chat he had with Mike Peters really lifted his spirits around a year ago. I personally also find Mike Peters an especially inspiring character because of the great music he's produced and because of the continued positive attitude to life that he has shown through the hardships he has suffered so I have always felt that I want to give something back because of that too. Last year was particularly enjoyable for me as I was able to play along with the songs that were sung on my guitar. This also seemed particularly poignant to me as my Uncle Terry has always strongly encouraged me to keep up my music.